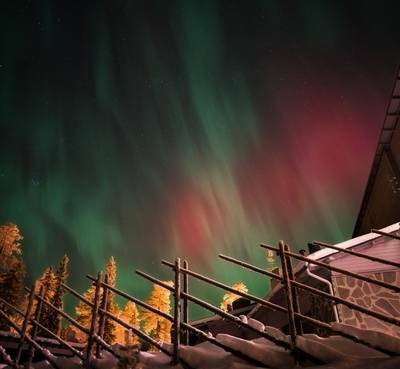 With spectacular scenery, a tremendous Northern Lights record and a huge array of activities, Luosto is an ideal destination for a holiday within the Aurora Zone. As Luosto is a small ski resort. There are seven slopes to keep downhill enthusiasts entertained as well as a network of perfectly maintained cross-country skiing and snowshoe tracks, so there is always a way to get outdoors and enjoy the landscape if not on an arranged activity (all equipment is available for hire and is payable locally). There are a couple of souvenir shops available and a small supermarket where you can buy drinks and snacks. 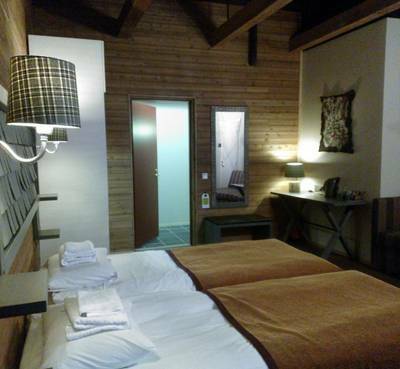 There are also two additional restaurants and a cheap and cheerful café at the small ski centre. 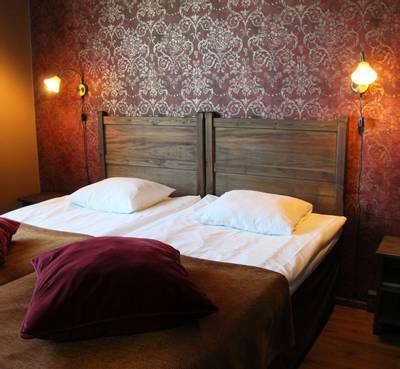 The Hotel Aurora is one of only two hotels here and has proved to be one of our most popular accommodation options in Finland with its boutique charm, excellent gourmet food and cosy rooms with private saunas. On arrival at the Hotel Aurora, guests are provided with an Aurora alarm. Essentially this is a mobile phone which will receive text alerts. 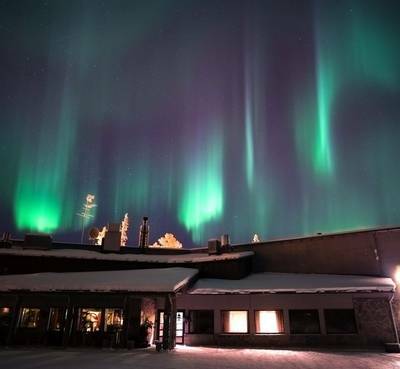 The alarm operates via the Geophysical Observatory in Sodankylä which sends a message to the hotel. If the conditions in Luosto are promising then the hotel will alert guests (until around 1 am - please confirm this with the hotel on arrival). The system is designed to aid you in your Northern Lights hunt but as conditions can change very quickly you should not rely solely upon this and should try and keep an eye out yourselves. There is a lovely dining area from where you can watch the chef in an open kitchen working on a lava stone grill. Local ingredients are very much to the fore and you will witness fish from the lakes and meat from the forest being transformed into delicious dishes that any restaurant would be proud to serve. Breakfast is a typical Scandinavian buffet and in the evening you will be served a set three-course meal (special dietary requirements such as gluten-free and vegetarian diets can be catered for if we are made aware of them at the time of booking). There's a small lounge area with a log fire where you can enjoy a pre or post-dinner drink. 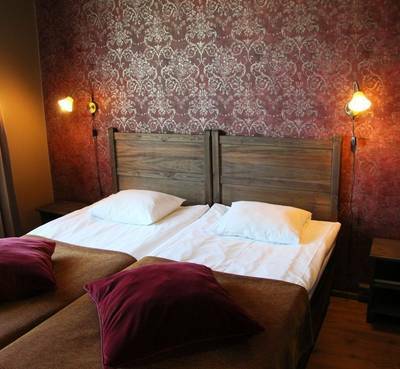 Hotel Aurora has eleven beautifully decorated and furnished standard hotel bedrooms. 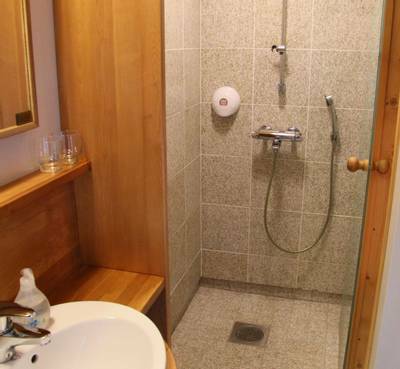 A combination of dark wood and warm colours creates a tranquil and distinctly Lappish atmosphere. 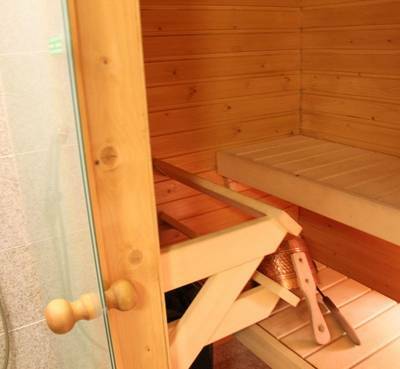 All rooms have their own private sauna and en-suite shower room with hairdryer. 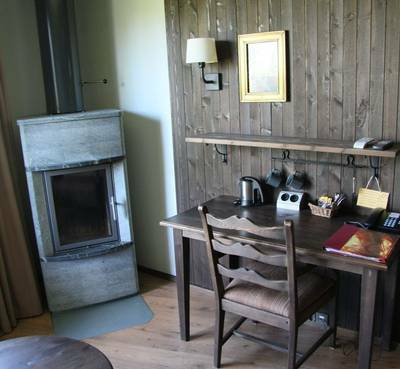 The rooms are also equipped with wireless internet, television, telephone and include tea and coffee making facilities.